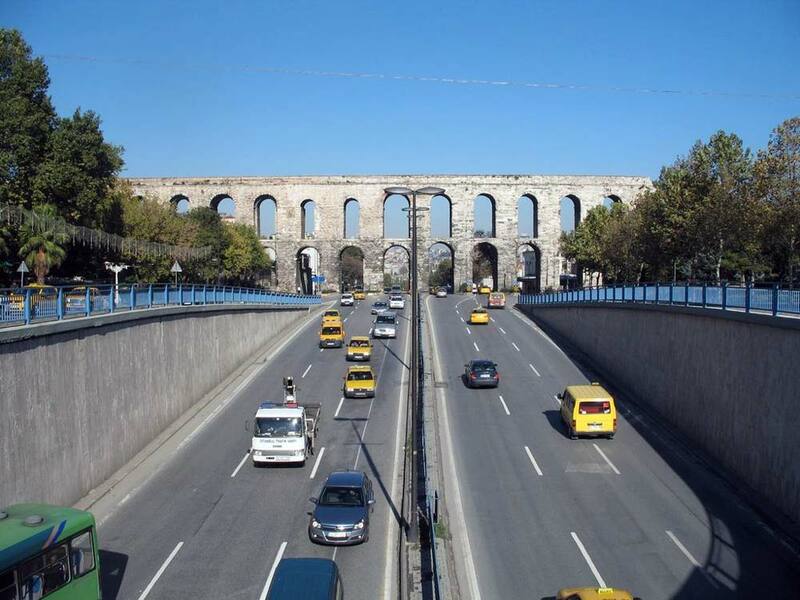 The Valens Aqueduct is an important Roman structure in the Turkish capital of Istanbul. First built by the Emperor Valens in the late 300’s AD, it was repeatedly restored in Ottoman times. The aqueduct was once the most important means of bringing water to the city once known as Byzantium or Constantinople. In modern times, the aqueduct has become an important landmark and one of Istanbul’s most popular tourist attractions. In Turkish, it is frequently known as the Grey Falcon’s Aqueduct, although this name is not used in either Greek or Latin. The aqueduct is situated in the Fatih quarter of Istanbul and joins the two sides of the valley that cuts through the district. The hills on either side are now the location of the Fatih Mosque and the city’s university, but were once well outside the ancient city’s boundaries. Exactly when the first attempts were made to build an aqueduct in this location is uncertain. Some sources suggest that the earliest plans may have been drawn up during the reign of Hadrian, in the second century AD. However, a more popular view is that Valens himself instigated the erection of the structure in around 370. By the time of Justinian, who reigned in the late sixth century, the aqueduct had become rather worn and unstable in places, something which necessitated significant repairs to be carried out. Further work was undertaken, generally at intervals of two or three centuries, throughout the early medieval period. However, from around the 11th century, the city began to suffer repeated sieges and invasions. Some of these were caused by civil war, others by attacks by the Crusaders and Ottoman forces. As a result of the city’s attacking and sacking, the aqueduct was badly damaged. Although historical records are incomplete and not always precise, it is known that the aqueduct provided water to a number of important buildings in the sixth century. These included the Cistern, the Ahilleus Bath and the royal palaces. By medieval times, according to the report of a Spanish diplomat who visited the city in 1403, gardens were also watered from it. The first Ottoman sultan, after the conquest of Constantinople, Mehmet II, ordered a major program of repairs and improvements, including the construction of new arches. This was done with the object of relieving what, by then, had become a serious shortage of water. The rulers who followed also carried out repairs and enhancements to the aqueduct, including further new arches. One of the most significant of these restorations was carried out on the orders of Mustafa II in the late 17th century. Without this work, none of the aqueduct might have survived intact to the present day. The structure now measures about 3,180 feet in length, although in its earliest days it is said to have been slightly longer. This uncertainty is partly because large portions of the structure no longer exist, although modern restorations in the 1980’s and 1990’s have safeguarded what remains.